Successfully Added 68 Key Folding Keyboard - Bluetooth 3.0, Function Keys, 310mAh Battery, 30 Days Usage Time, Android, iOS, Windows (Black) to your Shopping Cart. Productivity in your pocket with this 68 key folding Bluetooth keyboard suitable for most Bluetooth enabled devices. This compact Bluetooth keyboard folds up to a convenient size of just 127 x 88 x 22mm so its easy to fit in your pocket or bag and at only 170 grams won't weigh you down. Having 68 keys this mini Bluetooth keyboard lets you remain productive with Tablet PCs and smart phones wherever you go, so you no longer restricted to the confines of finger typing on your touch-screen. When you really need to express yourself the swipes and finger typing of even the largest touch screen can be cumbersome and trying but with this Bluetooth keyboard you have all the functions and key to type up a long email, blog or document on an ergonomically designed keyboard that makes typing enjoyable again. A built in 310mAh battery brings this folding keyboard enough power for 30 days of usage at 8 hours per day before it needs recharging and comes in a protective plastic sleeve that doubles as a screens stand. This offer a convenient way to support your phone or tablet while you type away in comfort on the ergonomic keyboard. 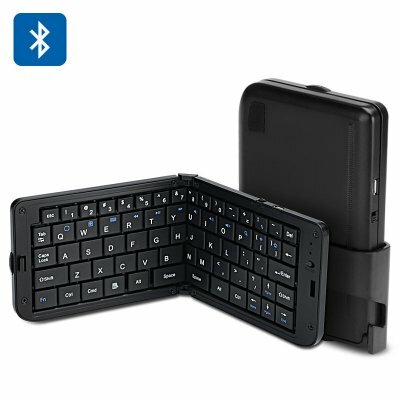 With a 10 meter range and support for a wide range of systems including Windows, Android and iOS devices this mini Bluetooth keyboard is great for computers, TV boxes, tablet PCs, Smartphone and more. With a range of functional keys for multimedia shortcuts you can enjoy portable productivity at wholesale prices without sacrificing portability. This 68 key folding Bluetooth keyboard comes with a 12 months warranty, brought to you by the leader in electronic devices as well as wholesale gadgets and accessories..